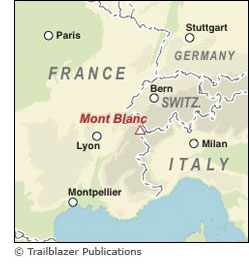 120mm x 180mm 5" x 7"
At 4810m (15,781ft), Mont Blanc is the highest mountain in western Europe. The snow-dome summit is the top of a spectacular massif of peaks stretching 60 miles by 20 miles, arguably the most magnificent mountain scenery in Europe. Circumnavigating the massif and passing through France, Italy and Switzerland, the Tour du Mont Blanc is a waymarked trail of 105 miles (168km), taking 10-14 days.